The Dragon's Demand SoundPack from Syrinscape is a complete audio solution when playing The Dragon's Demand adventure. 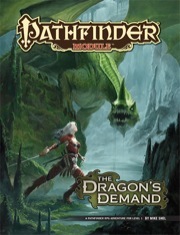 The Dragon's Demand is sanctioned for use in Pathfinder Society Organized Play. Its Chronicle Sheet and additional rules for running this module are a free download (356 KB zip/PDF). To start, the foldout map of the town was great to have. Between the Syrinscape sound pack, the Face/Item/Quest cards for Dragon’s Demand that I could give my players, and the Hero Lab encounter library from Lone Wolf Development, I was free to focus on just learning the module, tailor it to my table, pick pawns, and decide on maps, which was fine considering how much extra time I had. I was able to learn the setting and its people, so that I did not need to reference the book very much during play. Having a town with the right amount of detail (shop names, npc names, mannerisms, etc.) it was easy to elaborate on the setting and bring it out. So, the module greatly enabled me to focus on bringing the setting to life at the table, rather than focusing on the mechanics of it all, from the resources in the module itself and the external support. This is based on the first half. I'm not positive we'll see the rest and I really feel like writing a review. (2) The GM chose to play buying and selling strictly by the rules, meaning there was nothing useful we could buy. So the cash awards came across as a useless tease, and the well-equipped friendly NPC came across as an even worse one. I'm told that this reverses later, but short of the GM flatly telling them, the players won't know this. Having "there's money but you can't buy anything," "there's treasure but you promised not to take it," and "there's treasure but it would offend a valuable ally if you took it" back to back in an arc where the PCs were missing very basic stuff...not that much fun. It might have been a good idea to tell the players "No resupply until much later" right away, as one would for _Serpent's Skull_ #1. I'd have made a different character if I'd known. (3) I know it's standard for modules, but still, I hate going up a level every session, especially when the events are so crowded together. We went from 1st to 5th in 4-5 days, and the whole dynamic of interacting with the townsfolk became bizarre. So, a lot of griping. I did like the early parts quite a bit. GMs may want to carefully read through the Manor House and see if it's likely to be a bad fit for their group as it was for ours. Writing this review while its still all fresh in my head..
Party: Occultist, Paladin, Samurai, Inquisitor of Iomedae, and Rogue. An easy recommend. I GM'ed the module over the course of about 3 months, with fortnightly games. And I think the players really got a kick out of it as well. The entire thing felt very cohesive plot-wise, with each dungeon feeding into the overall plot. Admittedly the players didn't quite pick up on the entire backstory, but I've found that tends to be the case with most RPGs. NPCs were memorable and the players found themselves checking in on certain villagers every time they came back from an adventure. The only bad thing I can say about it is that it has ruined Paladins for me. We had one in the party, and in the space of a single round (with a few buff spells) managed to land 3 critical hits against the BBEG. There wasn't a lot left of the poor BBEG after that. Not to mention he had passed all the saves and blocked every attack sent against him. And just for reference the Samurai got killed in round 2 of the same fight. That said, the final boss did get to use all their "tricks" which for me as a GM is deeply satisfying. Like I said, its a great module, and if you feel like you can't commit to a full AP, then this adventure is a good alternative. Picked this up my first module to run as a DM. Everything was well laid out and easy to follow. The pacing was good and even allowed for some additional encounters to be added in. The map of the town was nicely detailed. I recommend this for any group, but it is a superb intro to the pathfinder world for both DMs a players, covering a large variety of creatures, terrain, and experiences. I really enjoyed this adventured, I GM'd for a group of 5 players, 1 brand new, and 2-3 who haven't played Pathfinder before. I highly recommend this module, the encounters were good and the plot was pretty solid. I do have some minor annoyances, but they are greatly outweighed by the quality of the adventure. 1. The maps - They were great, they were all distinct and looked great. Unfortunately most of them were hard to draw and since the GM is only one that really gets a good look at them in the book a lot is wasted. Some of them are nice and easy to draw, but some of them are just a map drawn and then a grid overlay thrown on top, it would have been nice if the artist had at least kept mostly to a standard grid line just so it's nice and easy to make. The crypt of Tula is nice with it's room types (oval and circular) but it doesn't translate too well into a drawn board. The monastary is HUGE, I had a Chessex Mondo mat (4.5'x8.5') and two mega mats (3'x4') and the Monastary took up most of that (and I had to fit some rooms on there by making up space). I really like drawing everything, so if you don't it's not a big deal. I wish they offered a printed map pack of it. The only included combat map is pretty much the most useless map in the whole adventure. 2. The story - Good story, adventurers come into town and investigate some problems, root around and find a dragon, kill dragon, save the town, become ultra wealthy. There were good NPCs there, though the guidance on much of it is pretty ambiguous, so some of the background I didn't feel I utilized well. The plot for the town was very nice, and I hope that makes it into more modules. 3. Loot - Starting at the tomb your players will get a TON of loot, and some of it's super expensive. So if you're planning on continuing the adventure after this module you need to take that into account. But the players love it. 4. Combat - There's a good mix, from the traditional dragons and kobolds, to the unusual, running through a wizards house. Good mix of everything, I enjoyed it, there were some encounters that were really easy, and some wern't. I added more to pump experience into the players because to hit the experience marks the module wants you is pretty tight with 4 players. In the end my players made it to the last fight at level 6 instead of 7, but they ran the encounter very well and wern't at risk (only one death). You have access to some DM NPCs to act as a release valve should stuff get too tough (and they are pretty darn powerful). 5. Overall - I'd highly recommend it, and wouldn't hesitate running it again, Mike Shel wrote an excellent adventure. Note that this product marks a big change for the Pathfinder Module line, shifting it from 32-page bimonthly adventures to 64-page quarterly adventures. They'll also include a double-sided poster map. This change gives us an opportunity to make Modules into special events, as they can now carry more adventure content than a Pathfinder AP volume. They will continue to be playable within the Pathfinder Society—though they'll obviously take longer to play! WOW! I didn't see that change coming. (Hmm I wonder what this will do regarding the RPG Superstar contest)? Will it now be a proposal for a 64 page mega-adventure? I like this change a LOT. Also - Mike Shel. Win! We're getting pretty close to launching RPG Superstar 2013, so... you'll find out soon! Note that halving the frequency and doubling the page count means that the number of pages we produce each year isn't changing (though we are making 3 more poster maps per year). Frankly, we haven't got the bandwidth to add more pages per year. This is an awesome change, and will be the perfect thing for my Sunday night groups. We occasionally do APs, but we swap out GMs a lot. This will be a really nice way to have a strong campaign story that goes for a while, without getting into a full AP. It is Quarterly, but they're twice as long. These could be interesting. In my opinion the old Modules seemed too short to be worthwhile, but these might have a good balance between being long but not taking up an entire adventuring career. I think I might have to renew my subscription. I'm also intrigued enough that if I can, I think I'll subscribe to the Modules line again. And Vic ... looking forward to the announcement of RPG Superstar 2013! Good change. The 32-pages were just plain too short to splash the water, of all the modules insofar the only one that blew things out of the water *and* didn't feel like it could use 20 or more pages was Harrowing, but there's only one Crystal Frasier on this planet. Ordinary mortals totally deserve the extra space for their wings to unfurl. Yeah, I don't know about this. I mostly use modules for short sidequests during an ongoing campaign, so I like that they're episodic. 1st through 6th level makes it a lot bigger commitment, more like a mini-AP. Not sure this fills the right niche for me. PFS scenarios have been getting longer over time... perhaps they'll suit your need for sidequests? The new format is a lot to digest. I really like the module size as it is (longer than a scenario, punchier than a AP chapter) but this means we're getting MORE adventure per year for LESS money, so clearly, I'm in favor of it. I'm just scared by the unknown. Also, it's a first level module with Kobolds and dragons. My Beginner Box game will eat this up. I'll miss one shot modules, but I'd also like to see how this pans out. Now for a Numeria module! I can answer that (sorta)! While it's more pages, it's fewer projects, and often a lot of small projects takes longer than one large one. Every new product developed has a period of switching gears, getting a feel for what's there at the start, and what needs to happen to it in development. You'll note that the 32-page modules haven't been truly bi-monthly in a while, and part of that is that they're being done in between other relatively small products coming out even more rapidly (Pathfinder Society Scenarios). With this shift in size and frequency, the hope is that we can develop the quarterly modules in one big chunk of focused time, rather than juggling them with other small, frequent products. There's also nothing saying that all 64 pages of a given module will be adventure (just as the current 32-page format also includes new monsters and location writeups). It's possible we can include adventures of varying lengths with supporting content to fill it as needed based on the type, location, and style of the adventure. Only time will tell what direction the line will ultimately go in both in terms of content and style, but we're hoping this change will serve our customers' needs while also being easier for us to produce with the regularity everyone wants and at the standard of quality we pride ourselves on. Well, my only qualm with this is that it will probably end up reducing the amount of high level modules even further. I like having post-16 modules. And tehre are really only 2 so far. That said, hopefully this'll enable a test of the Starstone Module. I wouldn't be surprised to hear reports of James' mad cackling at the thought of the type of adventures 64 pages allow. Mike Shel reasserted himself as a real treasure trove of adventure for you folks. Glad he's back in action. Looking forward to this with great anticipation. It's true—there's a LOT of adventure plots that a 64 page adventure can do that neither an Adventure Path nor a 32 page adventure can adequately cover. The big "fight the dragon" adventure's a good example... and as it turns out, that's what our first adventure in the new format's gonna be all about! I really like the change, from what i have read. Many of the latest modules (which I liked as always) made me think 'damn, they could have done sooo much more (as in more module, not as in better module) with this' (especially Moonscar and Deepmar), so I really look farward to see longer modules that allow Paizo to explore ideas and locations in more depth. While I would have loved to see bi-monthly modules, I understand that would probably break the spine of the line (and possibly the minds of some of the writers...) and the PFS modules of this season seem good (and expandable) enough to fill my urge for none-AP adventures. Will the poster maps be more likely encounter maps for use with minis or geomaps/citymaps? I dropped my modules subscription over things exactly like what this change seems to combat. Now if you just stop making them start off at 1st level, I'll re-up. For now, I might get this in PDF. Might. 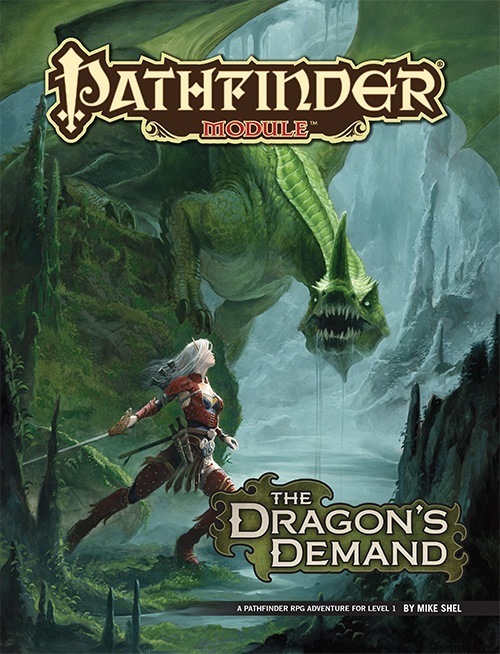 While "The Dragon's Demand" starts at 1st level (but likely allows for PCs to reach 6th or 7th level), we aren't planning on having all the modules do so. Just as before, each module will start at whatever level is most appropriate for the story it's telling. The poster map in each module will vary. Sometimes it'll be a map of a village. Sometimes a wilderness region. Sometimes a dungeon. Sometimes a minis-scale battle mat. Sometimes something else. While I would have loved to see bi-monthly modules, I understand that would probably break the spine of the line (and possibly the minds of some of the writers...) and the PFS modules of this season seem good (and expandable) enough to fill my urge for non-AP adventures. Will the PFS scenarios be able to fill this nitch? Will the poster map be made to be written on much like the Pathfinder Maps? Nope. They'll be on the same paper stock as the pages of our books. I think the new format sounds great. Love the change of format and looking forward to more Shel. Mini-AP, seems like a good idea. I'm looking forward to this. I am pleased to see Mike Shel do the flagship relaunch of this line! The possibilities this new format opens up are exciting my molecules. This really makes more experiemental adventures/modules set in less "mainstream" settings less of a risk to give an in-depth meaty treatment. Imagine if Moonscar was 64 pages for example! While I'm sad to hear that the release frequency for the modules is being dialed back a tad, I have to say the change overall excites me greatly. Very cool decision Paizo. Now, to dream of a 64-page super adventure set in Mendev. My thoughts exactly. Moonscar was great, actual high-level stuff, but way, way too short. Mud Sorcerer's Tomb is still one of my Top 5 favourite Adventures ever! Taldor? Kobolds? Dragon? 1-6 module? Maps? More pages? This seasons - more or less, yeah. While they are smaller in scope then regular adventures, some parts are easy to expand (by adding roleplaying opportunities, additional encounters or challenges), and some scenarios are work great together, and with two scenarios per month that gives me enough 'adventure page count' to get the same use from PFS scenarios as I get from the bi-monthly module - even if it requires a bit more work then just adapting a module to my groups needs. OTOH, with less modules and more invested in each, there will be less chances for experimental adventures. This new format sounds awesome to me, now I might start getting the modules again. Also this opens doors to modules on Castrovel, Akiton, Numeria, The First Worls, etc. and it will do them justice that a 32 page one couldn't do.